Agent to handle your real estate needs. Are you looking for a Second Home or Investment Property on Alabama's sugar-white sands? Then come to Gulf Shores Alabama! SOLD! Gulf Shores Beachfront Condo in Crystal Shores!! Would you like to own your own Alabama waterfront condo or beach home? Please feel free to browse through this Gulf Shores Real Estate website to explore the Baldwin County communities of Gulf Shores, Orange Beach, Fort Morgan, Foley, Bon Secour, Miflin, Elberta, and Josephine, Alabama. We have an Online MLS Search you can use as a comprehensive online tool, offering direct access to the latest properties for sale in your area. Luxury Alabama beachfront or bayfront fully furnished or unfurnished villas with pools, piers and many more amenities. There is absolutely no cost to you for our services. All our fees are paid by the builder/seller. Alabama and Property Management, in conjunction with Baleu Realty Management, can offer advice and assistance with purchasing your investment or vacation home. (251) 709-4558, Michelle Beckham, Broker Associate, Bellator Real Estate can help you today. From Golfing, Shopping/Dining to Festivals, Mardi Gras, Lakes, Lagoons, Bays, Nature Trails, and Deep-Sea Fishing, Gulf Shores' sugar-white sand beaches have it all! Gulf Shores & Orange Beach: Collectively the luxury beach resort areas of the Alabama Gulf Coast have been discovered & new opportunities are becoming available today. 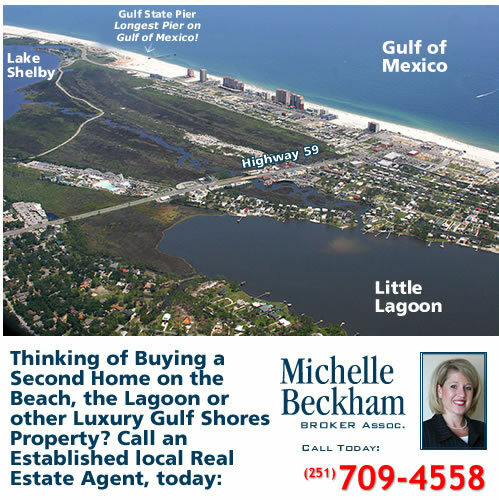 Use our Online MLS Search to find real estate for sale in Orange Beach, Fort Morgan, or Gulf Shores, as well as the surrounding communities of Foley, Elberta, Robertsdale, Perdido, Josephine, Lillian, and Foley.